An example of the sores. CHANCES ARE, YOU’VE never heard of Hidradenitis Suppurativa (HS). In fact, most people haven’t – but hundreds could be living with the disease without a diagnosis because they’re too embarrassed. 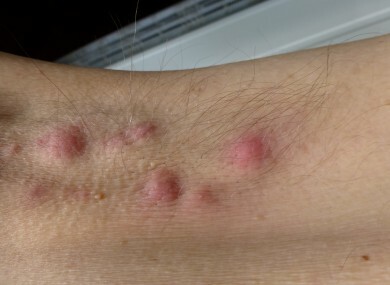 The incurable, chronic condition causes painful lesions, boils and deep abscesses in the armpits, groin and upper/inner thighs, between the buttocks and under the breasts can lead to devastating breakouts that rupture and leak foul-smelling fluid, soft tissue damage and painful scarring. People who suffer are reticent to go to the doctor as the condition is usually diagnosed as an STI or linked with poor hygiene, though these aren’t causes. It is however linked with obesity and smoking. It is common in adolescents, but can occur at any age, with women more likely to develop it. Philosopher Karl Marx is believed to have suffered with HS. The Irish Skin Foundation (ISF) has today launched a new awareness campaign around the illness, with one sufferer saying that the illness had changed his life. When I developed HS as a thirteen year old my life was turned upside down. I slowly changed from an outgoing and sporty teenager to a very self-conscious and anxious person. It was hard for people to understand what I was going through; relationships were impossible, simple things such as walking were difficult at times and I was in constant pain. I was later diagnosed with depression and I felt as if HS had taken over my life. However, Barry’s experience has improved in recent years, thanks in part to better treatments. Those who feel like they or someone they know may be suffering should see their GP or click here. Email “Hundreds of people could have an excruciating skin disease but be too embarrassed to get diagnosed”. Feedback on “Hundreds of people could have an excruciating skin disease but be too embarrassed to get diagnosed”.